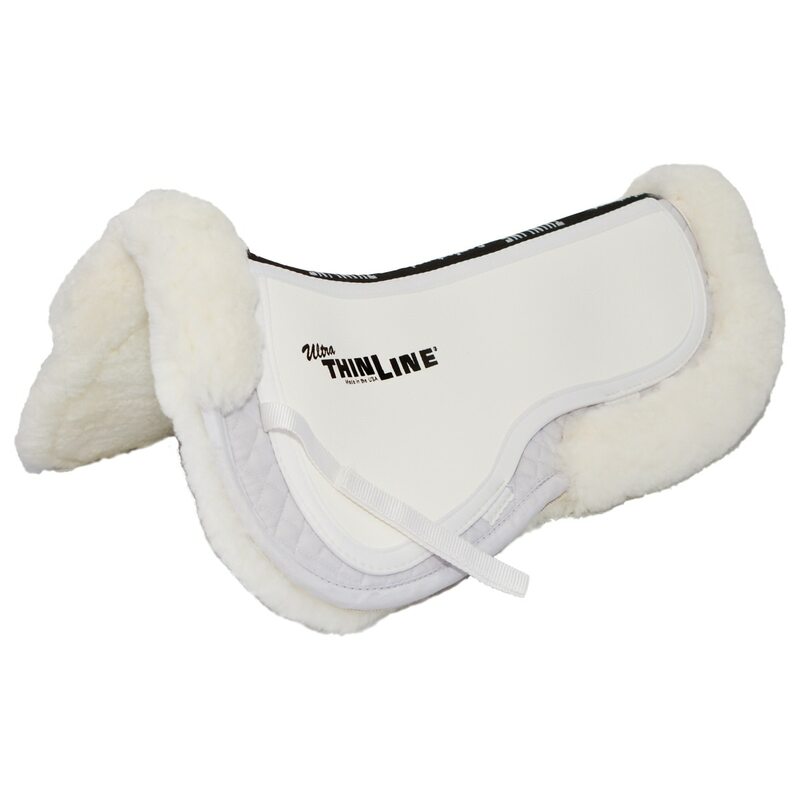 The ThinLine Sheepskin Comfort Half Pad is the preferred pad of some of the best riders in the world and for good reason! 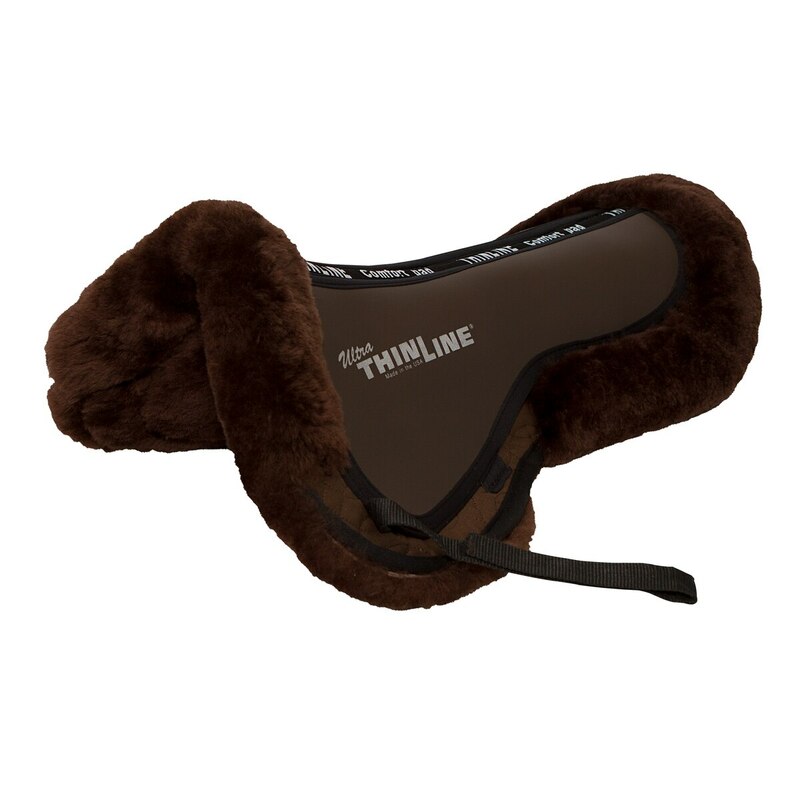 ThinLine products provide exceptional benefits for both horse and rider, helping to reduce rider movement, protecting the horses back, and creating a better saddle fit. Increases performance in how horses lift their backs, and all riders will sit closer, quieter, and be able to do more with lighter aids! Pockets to insert shims to help with minor saddle fit adjustments. Spine Measurement: Medium - 19" Large- 20.5"
Combo or full pads, like the Cotton Comfort, Sheepksin, or Felt pad lines, may be used alone. 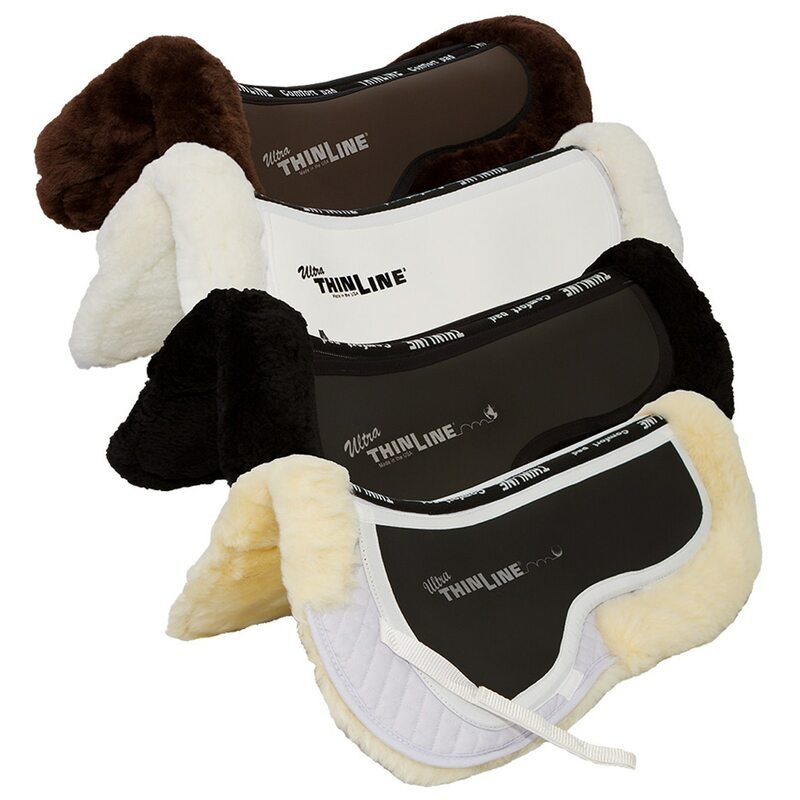 ThinLine sheepskin products are made with 100% medical grade merino wool on a real (non-synthetic) hide. Please follow care instructions carefully to ensure you product stays under warranty and to ensure product durablity. For Regular Maintenance – The most important thing to know about sheepskin is that it hates to stay wet. If you ride the sheepskin against the horse or get it thoroughly soaked make it is dried quickly. Place the pad sheepskin up in a cool environment. In humid climates use a fan to blow over the pad. Sheepskin must be allowed to dry fully between rides. Once the pad is dry, a light brushing of the sheepskin with a pet brush will separate the wool fibers and help to keep the wool fluffy and resilient for the next ride. Ride, flip sheepskin side up in your tack room, brush occasionally. A simple daily/post-ride brushing is all your pad needs if not too sweaty from the ride. Washing Sheepskin—Pads should only be washed when absolutely necessary, which should only be about 2-3 times in it’s lifespan if the above maintenance care is followed. Sheepskin saddle pads are best washed by hand in cold water using one of the following 3 approved products: Eucalan, Johnson & Johnson’s Baby Shampoo, or Ivory Snow Flakes. These products have been tested on sheepskin and are covered under warranty. You may machine wash (although hand wash is preferred) in a front loader, no agitators against the pad, single wash cycle only. Remove excess water in the pad by carefully squeezing the water out or placing in your washing machine on the spin cycle. To keep the rolls clean and extend washing cycles, especially on white pads, you can lightly spray Scotch Guard the rolls. Medium- Fits most saddles up to 17.5". Measures 19" wide between the rolls, and 23.5" long including the rolls. Large- Fits most saddles larger than 17.5". Measures 20.5" wide between the rolls, and 25" long including the rolls. Spine Measurement Medium - 19" Large- 20.5"
Special Features Helps reduce rider movement. Allows for minor saddle adjustments. Protects the horse's back and increases performance in how horses lift their back. 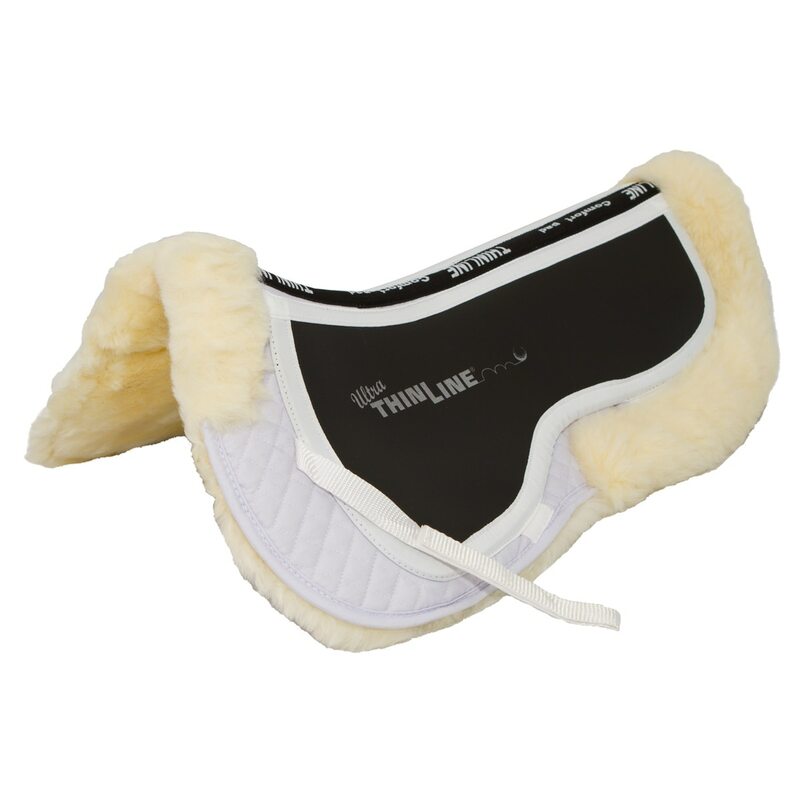 ThinLine Sheepskin Comfort Half Pad is rated 4.5 out of 5 by 81. Rated 5 out of 5 by Jenicis from Great half pad! I have the quilted cotton back thinline and decided to upgrade with the sheepskin. Pricey but worth it! My horse seems much more willing to move out and my comfort has increased in the saddle too. Pad looks well made, I love that it has the options for shims and love that the wool isn't too thick. Rated 4 out of 5 by Mars88 from Offers great back protection I got this for my mare to try and help with back soreness. So far I think it's made a difference. She seems more comfortable overall. I haven't had it long so I can't speak to its durability but it seems well made. Rated 5 out of 5 by Passport from Every Single Ride. I use this pad on a dozen different horses. It seems to work well with a saddle that has good fit, and improve the fit of most saddles that are just a bit off. I believe the shock absorption is top notch. The surface of the pad helps it be a "no slip" type, staying exactly where I put it. Ill always have one of these in my rotation, and if I'm really lucky, I'll have two! 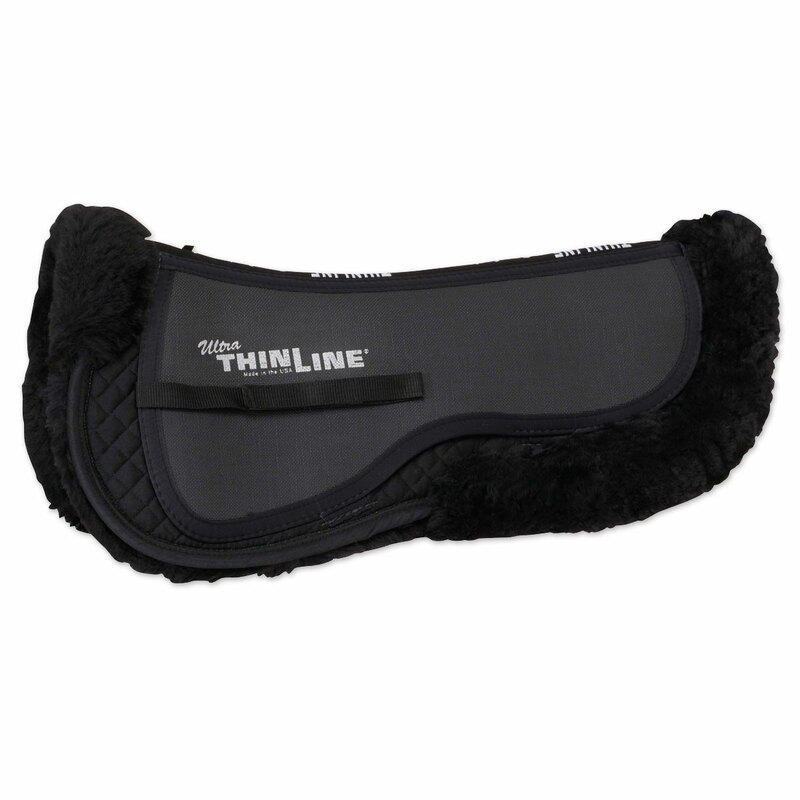 Rated 5 out of 5 by jenv from Good pad I have other Thinline products and purchased this for a new horse. He likes it and it seems to be holding up okay. Rated 4 out of 5 by Willa from I love this and my horse does too I've been riding with this for about a month now. My saddle feels nice and secure and I love the fact that its comfy on my horses back. I got it in black. The only thing I would do to improve it is put some sort of tag or marker where the center is. My horse is really tall and it's hard for me to tell if I've got it centered under the pommel. Rated 5 out of 5 by SlgD from Outstanding quality! This is one of the nicest half pads I have ever used. When you look at the materials and craftsmanship that have gone in to it, the price is more then fair. It is not too bulky and looks super fancy with the sheepskin. Use it it daily and is holding up very well! Rated 5 out of 5 by ROBIN from back Saver We use these on all of our therapeutic horses for their riding lessons. I truly believe that they are a huge help with keeping our horses backs from getting sore. therapeutic horses have to carry mainly unbalanced riders and we have had far less back issues since we started using the Ultra Thinline sheepskin Comfort Half Pad. 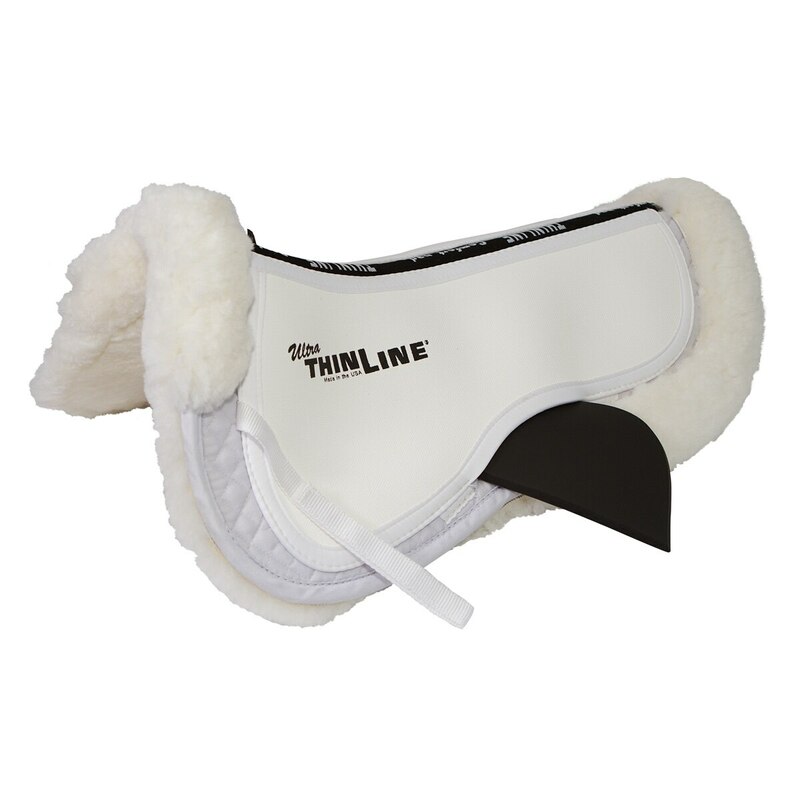 Rated 5 out of 5 by Carol from Love the soft sheepskin padding This is the only saddle pad by trainer suggests for use on all her horses. Rated 5 out of 5 by LizH from Worth the money My sensitive mare loves this pad. Her trot is more forward and her shoulders are freer. Rated 5 out of 5 by MelG from Awesome Pad! I bought this a month or so ago and have used it on 2 different horses with great results. My OTTB was more pleasant under saddle and my QH/TB cross showed jumpers in it with great results. I placed the shims for the QH/TB mare as she is older with high withers. Would definitely purchase again!